Strip-building is the art of taking a stack of small strips of wood and converting it into a beautiful and durable water craft. This process has been a popular method of making canoes for years. It is easily within the means of the average do-it-yourselfer. It does not require a large investment in specialized tools or a long apprenticeship to achieve a beautiful result. I have been paddling since I was a kid. Mainly in my parents canoe and a kayak my father had made from a kit. When I got out of college, I wanted a boat of my own. I had read about the idea of a "sea kayak", but had never seen one. It sounded like the ideal vessel. It combined the fun of my father's little kayak with the place I best enjoyed paddling. The problem was, being a typical college student, I didn't have enough money to buy one. A couple years previously, my father bought a book, Building a Strip Canoe, by Gil Gilpatrick, and I helped my brother build a canoe from this book. I figured that I could probably make a decent kayak using this the strip method. I researched everything I could find out about sea kayaks and thought about what I wanted to be doing on the water. Then, on the floor of my parents dining room, I drew up a kayak. This kayak took form in the basement of my brothers house. With couple trips out on the waters of the Maine coast, I was hooked. My brother tried it and he was hooked. He took my forms and built a kayak of his own. His friend tried it and was soon building one of his own as well. From that beginning I learned about sea kayaking. My growing kayaking skills, the inevitable flaws in any first boat and the fun I had building the boat, incited an urge to build another kayak. I am now deeply addicted to both sea kayaking and kayak building. I build my own boats to use "hard". I want a kayak that performs well in a wide variety of conditions from backwaters to surf. I have refined my designs to the highest performance standards. I include three designs in this book. For the beginner I have a design that has served me well for ten years. This is a stable, comfortable, easy-to-build kayak. Due to the simplicity of the lines, this design can be adapted from a small paddle boat to a roomy two-person kayak. The second boat is a high performance design suitable for intermediate and skilled kayakers wanting a boat for day use and overnight trips. This design provides the builder more of a challenge than the first kayak. Influenced by the kayaks of Greenland, this boat would look good when made of plastic and painted white, but is spectacular when made of wood. Many builders want a boat they can share with a friend. The third boat fills this desire. Based on the high performance lines of the second design, this boat is a comfortable tandem. The body of the book is a comprehensive description of the building process. Books that leave out crucial details can be very frustrating. It is my intention to help a complete novice construct a finished kayak after reading nothing but my book. I describe alternate methods for builders who feel the initial description is beyond their ability and urge the experimenter to take risks. It is important to describe why a step is performed a certain way so the builder can make an educated choice. An large part of the fun of building kayak with wood is the beauty of the finished product. The wood alone is beautiful. The thin flexible strips provide a unique medium for getting creative. With the natural contrasts available in wood the builder has the opportunity to enhance the design of the kayak beyond the inherent grace and style of a kayak built of wood. I offer techniques to get the builder with an artistic bent started on making a kayak that is more than just a nice boat. 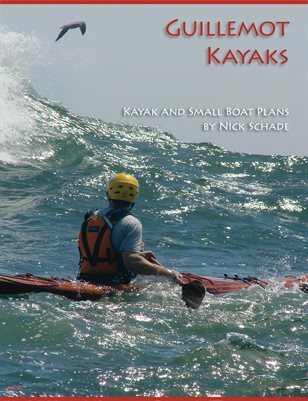 I include a discussion of the design considerations required to choose the right kayak either from my designs in this book or from other sources. I do not dwell on technical terms but give practical advice on what the builder should look for. The tools required to strip build a kayak are basic. Many of the tools are commonly found in the do-it-yourselfer's toolbox. Selection of the right tools will ease the building process. I discuss what is important to look for when selecting new tools and how to get the most out of tools the reader already has. One of the most difficult tasks when building a boat is finding sources of the specialized materials. The materials are not hard to get when you know where to look. I provide a list of reliable sources and offer suggestions on where too look for other suppliers. I urge builders not to sweat the details. The reason to build the boat is to get out on the water. I am addicted to building boats and paddling the boats I build. I want to spread the disease.